A pastel blue silk ensemble by Manish Malhotra paired with modern jewelry by Tanishq and flawless makeup courtesy Lakme transformed her into a chic bride. 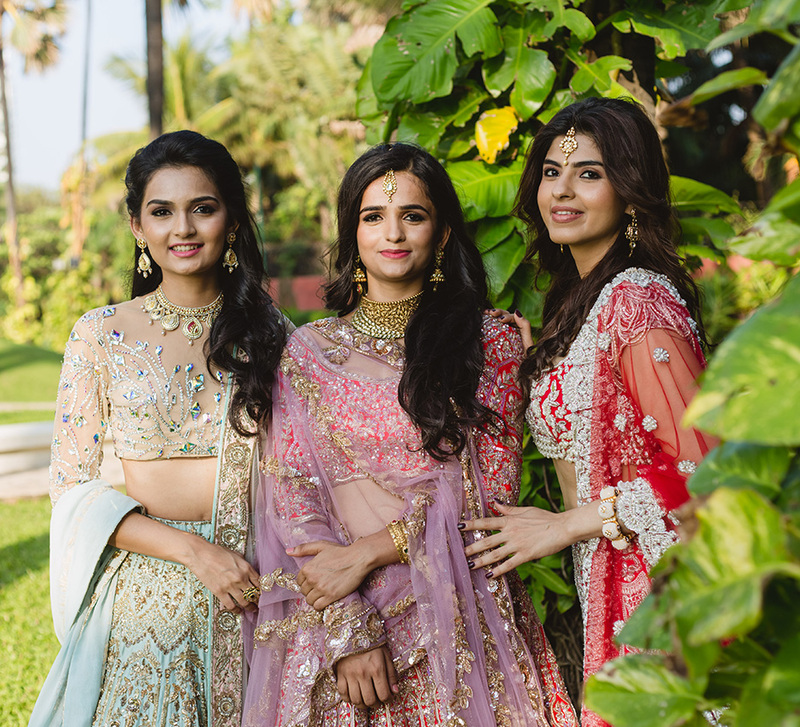 WeddingSutra, in collaboration with Lakmé Absolute and Rivaah by Tanishq, brings you 'WeddingSutra on Location' – a curated showcase of top bridal trends and style statements from some of our WeddingSutra Favorites. 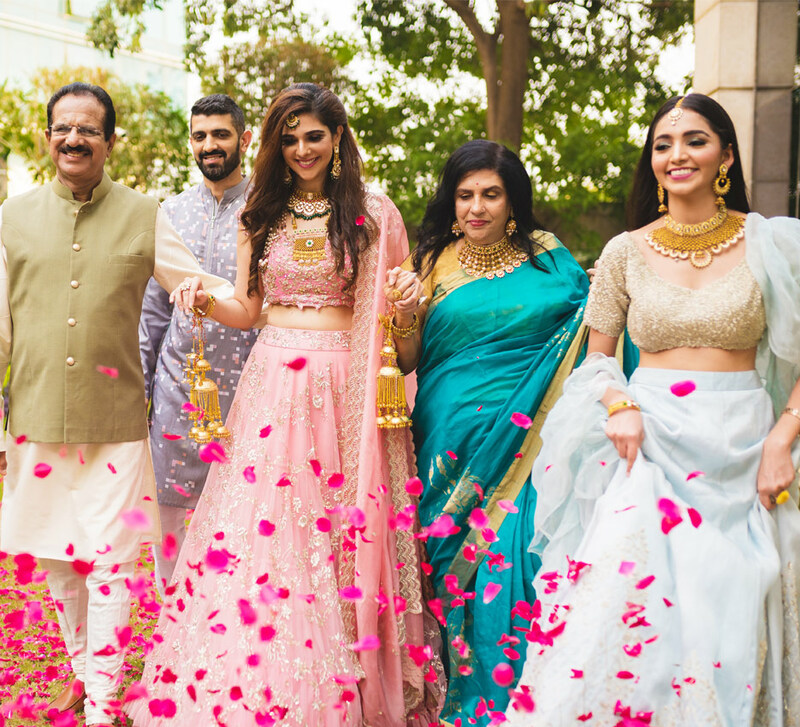 The latest edition of this popular bridal initiative took place at the luxe sea-facing retreat, Taj Lands End in Mumbai which offers striking backdrops. 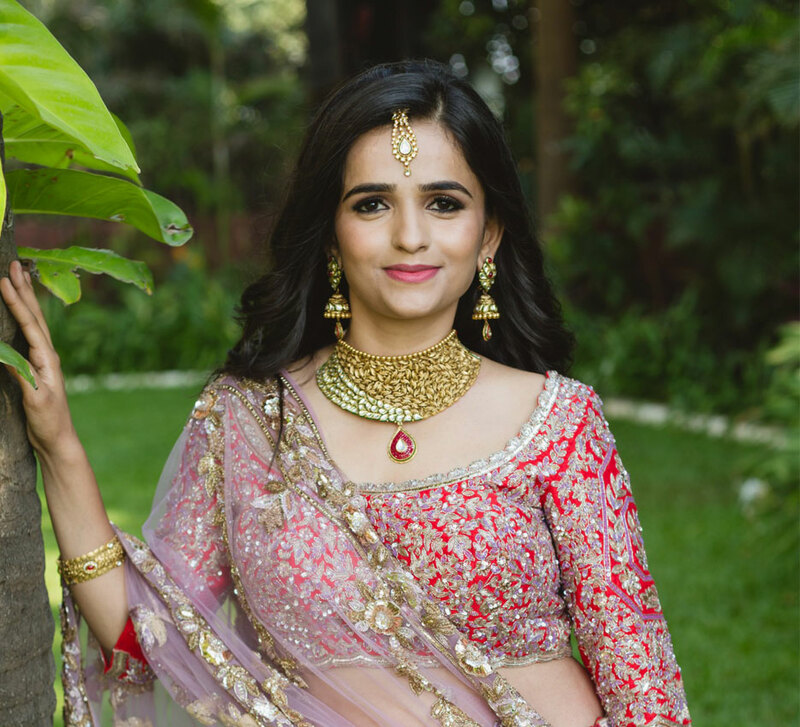 In the first of this three-part series, bride-to-be Minnat stepped into the world of top-notch bridal styles and services and emerged with a complete look that resonated with her tastes and the kind of bride she wanted to be. Minnat is drawn to muted tones and pastel shades and she wanted a bridal look that matched her tastes. So she picked a pastel blue lehenga by ace designer to the stars Manish Malhotra. 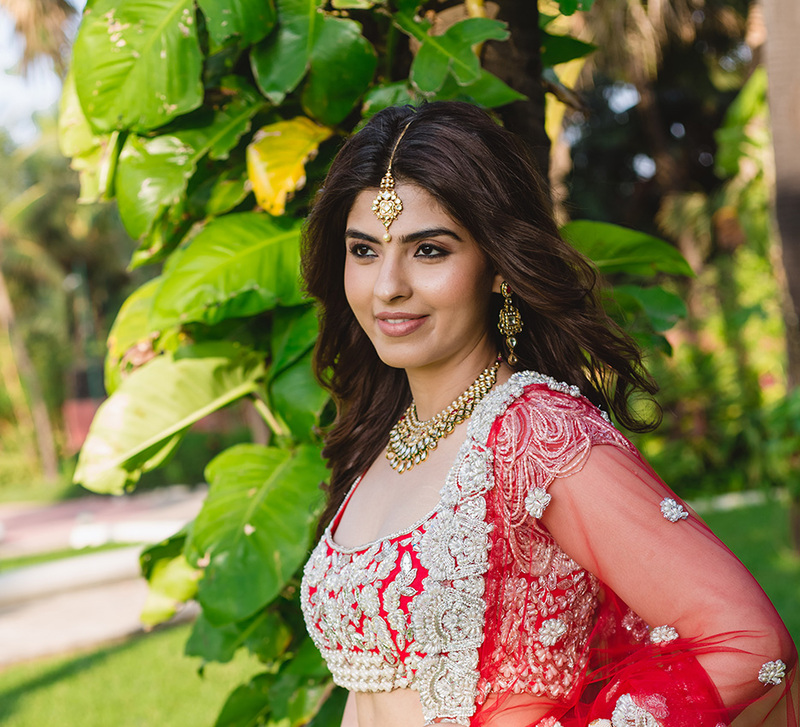 She shares why she was drawn to this particular outfit, "I loved that lehenga from the moment I saw it. It was a rather unconventional choice for a bride, but it looked so fresh because of the pretty blue skirt that I knew that this outfit was the one for me. Every the blouse was offbeat, and the handwork was very intricate. This lehenga was truly unique,” she said. The light silk ensemble featured a beautiful array of silvery sequins and pretty beads and had a translucent dupatta with an embroidered border. The dash of pink on the hem of the skirt added a further girlish vibe to the ensemble. For the final finish, Minnat carried a pretty clutch by Be Chic. Natasha Samant of The Storyteller was on her toes all day long capturing all the precious moments which Minnat will cherish forever. Makeup artist Sejal Sachnakul of Makeovers by Sejal created a dreamy visage on Minnat with trusted products from Lakmé's newest range - the Kareena Kapoor Khan Collection by Lakmé Absolute as well as the existing Lakmé Absolute range. It was all about metal with mettle when it came to the iriscendent eyeshadow on Minnat's lids which matched the sheen of her lehenga. Making use of the shimmering copper pigments, Sejal drew light to Minnat's eyes, which brightened the entire look. Minnat was impressed by the whole process, and shares, “Sejal was fabulous and one of the sweetest people I have met. She is someone who you would want to have by your side on your wedding. The look that she created for me was flawless. She worked with my complexion instead to trying to work against it. She did not try to lighten my skin color. Instead, she drew attention to my more prominent features which I appreciated. She even helped me out with my pre-bridal routine and even gave me tips on the kinds of foods that I should eat.” Manjula Sachin Jadhav styled Minnat's hair in way that played off her glossy tresses to perfection. Minnat’s look was designed to bring focus to the delicate shimmer on her lids which is in line with the latest in makeup trends - metallic eyeshadows. Therefore, makeup artist Sejal began by applying the Lakmé Absolute Argan Oil Serum Foundation in Ivory Cream that gave her a clean base to work on and then used the Lakmé Absolute White Intense Wet and Dry Compact to set the foundation in. The next step was about creating lids that looked like molten metal which she did with the help of the Lakmé Absolute Illuminating Eye Shadow Palette – Gold. To add a flush of color to her cheeks, Sejal applied the Lakmé Absolute Illuminating Shimmer Brick, and Minnat's look was completed using the Kareena Kapoor Khan Lakmé Absolute Lip Definer in Blushing Temptress.